As travelers, we know plans do not always go smoothly. In Eric’s case, he took a problem and repurposed it into an opportunity. The entire point of our website is to be sure travelers are bringing needed supplies to places that will absolutely take them to the community projects they support; thus eliminating logistical issues and uncertainty about what is needed. We applaud Eric’s responsible behavior as a traveler and the way he solved his plans going awry! By giving the supplies to a teacher for a school (even though it was not the school the supplies were intended for) instead of randomly handing out the supplies to children he came across, he did not promote begging and assured the supplies would be put to good use. I first heard about Pack for a Purpose on NPR while on my way to school and since my family and I were getting ready for a trip to South Africa this summer, I decided to pack some school supplies to bring with us. After checking the website for needed items, we headed to Costco and filled a bag with pens, pencils, highlighters, dry erasers, and more. Unfortunately, on our way to South Africa, the airline lost track of our bags and, by the time they finally delivered them, we were far from the designated point of delivery. Happy to be reunited with our possessions we began our trip north from St. Lucia, South Africa, to Kruger National Park and had to drive across Swaziland. During this trip I checked the Pack for a Purpose website to see if they listed a place where I could drop off the school supplies in Swaziland, but could find nothing. I was very disappointed, and I really wanted to give the supplies to schoolchildren in need, thus while driving through Swaziland I decided that we should look for a school to drop them off at. But, it was Sunday, and they were all closed. During our quest to find a place that could put our supplies to good use, we could see that every single school we found was very dilapidated. A far cry from the school I attend in Scottsdale, Arizona, which reinforced my desire to help these children any way I could. We finally arrived at the small town and stopped to find something to eat for lunch. We soon came across a helpful store owner and asked if she could tell us where there was a school that would be open on Sunday. She said the schools were closed, but was able to put us in touch with the local teacher to whom we gave the school supplies. She confirmed our suspicion that the supplies were desperately needed and she could not stop thanking us. 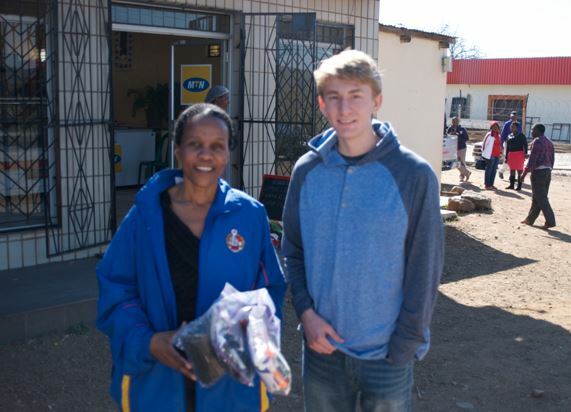 While I cannot remember her name, I will never forget how I felt handing over the bags of pens and pencils. Thank you for giving a purpose to my trip.